Home » Dutch Lady » house » lucky » lucky draw » purchase » qna » spend » Tesco » travel contest » vouchers » Dutch Lady Buy, Save & Win Contest: Up to RM100,000 worth of prizes to be won! Dutch Lady Buy, Save & Win Contest: Up to RM100,000 worth of prizes to be won! Buy any participating Dutch Lady branded products worth RM30 and above (based on amount paid inclusive of GST) in a single receipt at any participating Tesco outlet during the Contest Period. One (1) such original Tesco receipt entitles the participant to send one (1) SMS entry. Answer a question: “The Contest Grand Prizes are kitchen makeover worth RM10,000 each. True/False”. 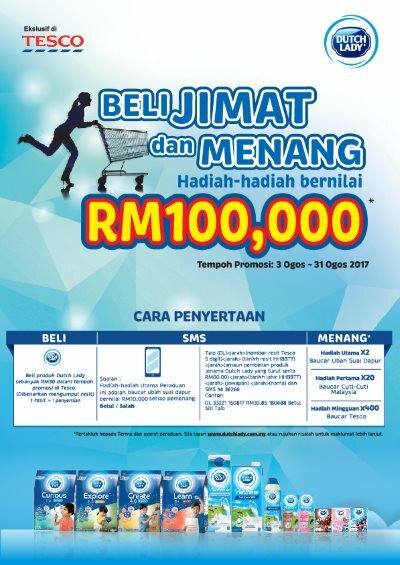 Type (DL)<space>(last 5 digit Tesco receipt number)<space>(receipt date DDMMYY)<space>(amount for purchase of Participating Dutch Lady branded products RM00.00)<space>(date of birth DDMMYY)<space>(answer to question)<space>(name) and SMS to 36266. Visit Dutch Lady Buy, Save & Win contest page for more details.